We've all had one of those days where it seems as if nothing's going the way we'd like, but sometimes we tend to ignore that those days are, in actuality, the product of our own mistakes, the consequences of previous decisions stacking atop one another. That's precisely the kind of day the main character's having in South Korea's A Hard Day (aka Take It to the End) -- which probably should've been titled A Hard Day ... And It's All My Fault -- revolving around a police officer who gets involved in a hit-and-run manslaughter and scrambles to cover it up, all while a bystander attempts to blackmail him with the information. The craftsmanship at work in Kim Seong-hun's thriller yields plenty of tension and black comedy from end to end, crafting a brisk experience that never really pumps the breaks on its momentum; however, the fact that so much of this "hard day" revolves around questionable circumstances, poor decision-making, and superhuman feats detract from its overall impact, resulting in fierce but dubious suspense. Granted, everything about this messy twenty-four hours isn't entirely the fault of Detective Ko Gun-soo (Lee Sun-kyun), who's also mourning the death of his mother on the day of her funeral. In a shaken mindset and working against the clock to arrive at the ceremony -- already attended by his sister and daughter -- he accidentally hits somebody in the middle of a dark street along the way. Coupled with his time constraints and questionable standing with the homicide department, Detective Gun-soo instead decides it'd be better to hurl the body into his trunk and dispose of it later on, unbeknownst of who the person is and the caliber of the obstacles that await him. Just as it seems as if he might pull off the cover-up, a phone call arrives at the precinct from someone who witnessed the incident, proceeding to threaten the detective's livelihood unless he cooperates. Reluctantly, Detective Gun-soo tries to investigate the blackmailer while also troubleshooting the caller's demands: to bring them the body. The premise sounds pretty grim -- the accidental homicide and blackmail following around a grieving single-father detective at a time when he really doesn't deserve it -- but A Hard Day frequently uses that tone as a vehicle for deadpan humor and outrageous suspense. Kim Seong-hun's script injects levity into the ominous situation with renegade remote-controlled toy soldiers, inopportunely-placed cellphones, and strategically-placed batches of balloons, drawing one's attention to the possibilities of what other shenanigans the scenario could feasibly produce. On the other hand, they also distract from the numerous lapses in practicality within the situations that Detective Gun-soo and the deadweight of his cargo get cornered into, leaving the film scurrying in the middle ground between the realistic mechanics of the situation and elevated shock-value antics. This results in unpredictable, engaging thrills that muster a lot of raw black-comedy energy, never veering into boredom with the directions taken. 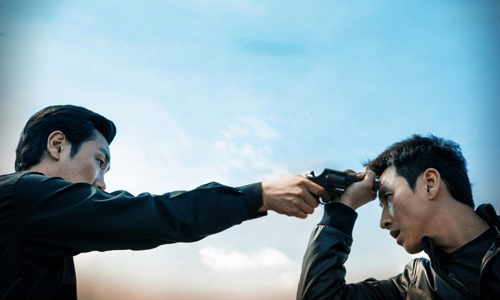 A lot of what happens in A Hard Day ends up being the result, the fault, of Detective Gun-soo being wrapped up in a corrupt police department, leaving one uncertain of how to feel about the main character and the trouble he brings upon himself later on. To bolster the film's pace and keep those watching from dwelling on the particulars, director Kim Seong-hun conveniently cuts away and jumps ahead during critical junctures in the detective's problematic twenty-four hours, unjustifiably getting him through road blocks and internal affairs' investigations when they really should've complicated his life much more than they do. The film also has the tendency of executing just enough police work to spice things up yet not enough to actually get the job done, where the connection of events predominately relies on the errors of law enforcement to keep them moving along. None of their dull corruption -- bribes and other under-the-table dealings -- accomplishes much more than making them seem dirty and unskilled, though, enough to excuse the cracks exposed by Detective Gun-soo's situation. A Hard Day also struggles in communicating the panic of the detective's cover-up maneuvers and the degree that it goes unnoticed around his fellow cops, touching on the complicated balance between what to show the audience and how to maintain a believable atmosphere. From the moment he plows into his John Doe, Lee Sun-kyun telegraphs a twitchy, alarmed performance that should naturally draw a lot of suspicion in a precinct full of corrupt cops -- especially in the midst of Internal Affairs scrutiny -- yet it largely gets disregarded or outright overlooked. The exchange, of course, comes in the fact that we're allowed to observe the unfiltered anxiety of a guy dealing with stress beyond his threshold, yielding a lot of gratifying surges of sweaty, wide-eyed suspense amid ringing phones and rifling through evidence at the office. His persona practically broadcasts that he's hiding something, though, and only so much of that can be brushed aside due to the loss of his mother, another example of the writer/director leaning on an unconvincing excuse to keep the thrills coming. And come they do, especially once the identity of the blackmailer steps into the light. Yet, like many other mysteries, A Hard Day gets too wrapped up in the inventiveness of zany circumstances to nail its landing as a credible whodunit, relying on peculiar happenstance to fuel the motivations of Detective Gun-Soo's foe. Following a reveal that's both anticlimactic and erroneous, the tension continues to escalate with a loosening grasp on practicality, weakening the detective's grasp on the situation and beefing up his antagonist's physical and strategic capabilities to significant degrees. Chaos takes over in a rambunctious conclusion that checks off necessary boxes -- a brutal fistfight, a monumental explosion, power fluctuations between the two up until the bitter end -- which, by way of Lee Sun-kyun's direction, never loses energy nor its ability to surprise as it stays true to the film's title. Alas, it's hard to shake off that our detective's day really wouldn't have been so hard with a little more cleverness and less naivete.